If it's the Christmas spirit you're looking to find, you won't find it in the game I just played. 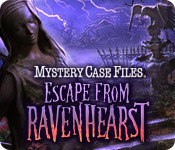 Mystery Case Files: Escape from Ravenhearst, which is the third - and hopefully final - in a running series by Big Fish Games. Anne usually does these walkthrough, but when the games site said in bold, red letters "psychological thriller", she quickly tossed this game my way and I was ecstatic. Until I played it. Halloween is over, Thanksgiving is over, Christmas is next! I actually get quite "Christmassy" - although a bit more "Nightmare Before Christmas" as opposed to Anne's "Yes, Virginia.. there IS a Santa Claus" bit. I flew back from Thanksgiving break eager to see my cat and Anne, not so much Jasper and Zavy, they can be so annoying. Speaking of annoying, Anne's parents sent home a lot of great leftovers. When Anne and I headed down to share in the leftover feast - it was all gone! Every single morsel had been gobbled up by Jasper and Zavy who then had the nerve to complain that there weren't any more leftovers. Seriously guys?! Anne and I have thus banned them from the television where we plan to sit and watch endless holiday movies until they both break down and ask for forgiveness and admit to total gluttony. Look boys, "A Wonderful Life" is coming on next hour! We also hid all their video games. Do not mess with two really mad, and hungry, women! If it's the Christmas spirit you're looking to find, you won't find it in the game I just played. Mystery Case Files: Escape from Ravenhearst, which is the third Ravenhearst game - and hopefully final - in a running series by Big Fish Games. Anne usually does these walkthrough, but when the games site said in bold, red letters "psychological thriller", she quickly tossed this game my way and I was ecstatic. Until I played it. There isn't anything wrong with it, per say, it's just really disturbing, even for me and I'm not easily disturbed. Granted, most Mystery Case File games are slightly disturbing, but this one went over the top. I don't want to give too much away, but suffice to say this is not for the faint of heart. If you have a sensitive stomach this may not be for you. You are called back to Ravenhearst because citizens are disappearing and you're sure they are somehow linked to your old nemesis Charles Dalimar, (Voldermort's brother?!) and his son, Victor. You're right of course, but you don't find that out right away. Eventually you are sucked into Charles world where you go through a series of chambers, or portals, and relive his life from his birth - in a really disgusting hospital filled with lifelike mannequins, his abusive childhood - where you have to perform the most disgusting things for his bedridden mother, also a lifelike mannequin, and eventually end up in the insane asylum where he was eventually admitted. Yes, more lifelike mannequins. If you've read this far and are still intrigued you'll probably want to play the game. If you've read this far and are already feeling queasy, stop now and go play something Anne would like. Aside from the bizarre plot, the graphics, as always, are phenomenal. I have to agree with Anne when she says that Mystery Case File games really set a standard for other casual games. Even freaky ones. The ambience is bone chilling with crying babies, screams of tormented souls, a deep voice telling Charles how stupid he is, etc. etc. etc. And it's still raining at Ravenhearst. Still. There is one whole hidden object scene in the entire game, so I would classify this as an adventure game. The puzzles are difficult and I won't admit to finding a few nearly impossible. There is one "lock" in the game that is just totally absurd and I can't even imagine what the creators were thinking! They did add a unique twist in game play that I've never seen in an adventure game before, but to the best of my knowledge it may only be available in the Collector's Edition. I won't spoil it, but I will say pay close attention to your surroundings. Otherwise, it really doesn't differ in anyway. You find items, you figure out where they go, you traipse all over the place, back and forth, solve a bunch of puzzles and eventually get to the end. I will admit - although I really shouldn't - I was actually happy to get to THE END! Warning: play at your own risk. Here's a few video teasers that might help you decide if you can stomach the game.